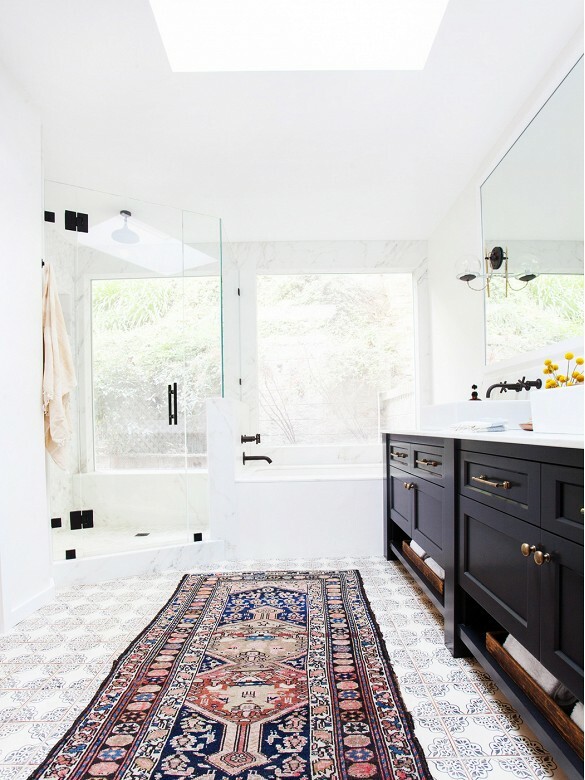 Today I’m going to share my inspiration for our master bathroom and the style plan that I eventually developed. 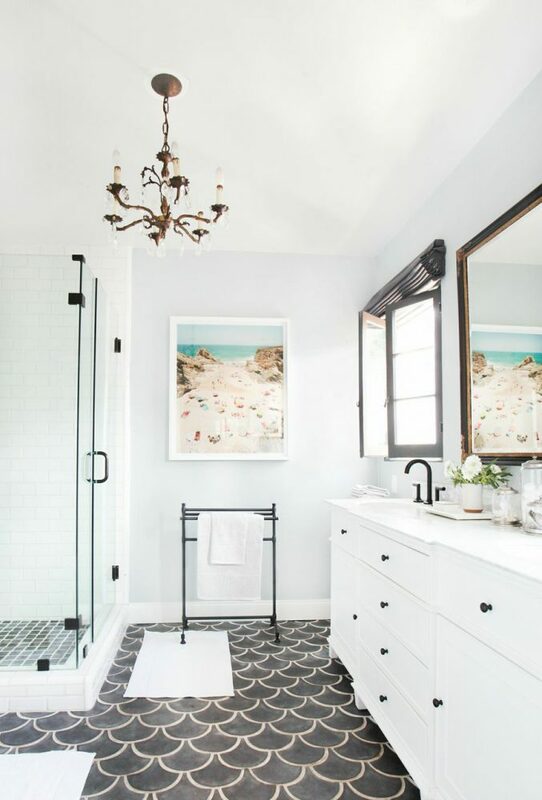 I focus primarily on kitchen and bathroom designs when I take on clients, so I tend to collect a lot of images of those rooms on Pinterest. When I was ready to start designing our space, I simply went through my bathrooms board and looked for repeating themes. Black, white, gray and brass – simple and clean with vintage inspired details. 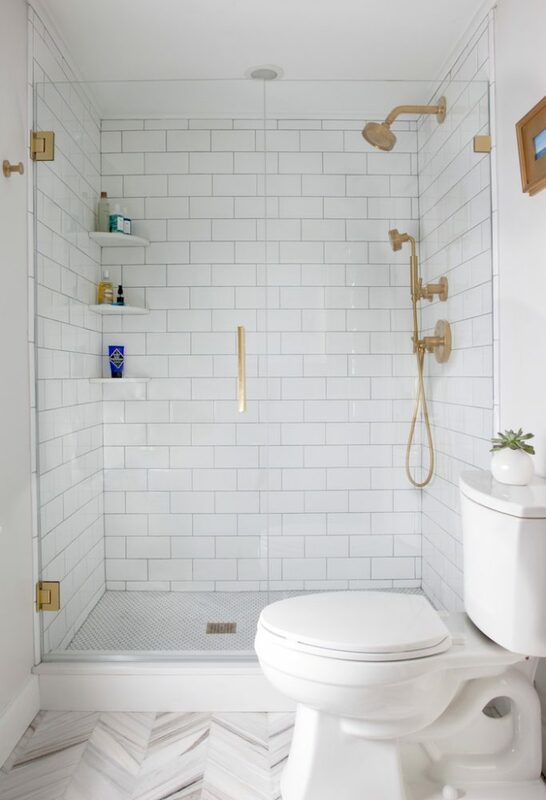 In a perfect world, I would have used patterned cement tiles on the floors, all brass fixtures, marble penny round on the shower floor and a handmade subway tile, preferably by Heath, on the shower walls. The custom built walnut vanity would float off the floor, and the large medicine cabinets would be flanked by vintage modern sconces kind of like these. Sigh. But two factors prevented me from the bathroom of my dreams – money and resale appeal. Our budget was tight since we had no desire (aside from painting) to do any of the work ourselves. This is Keegan’s busiest season, and I just don’t have the skills. Nor do I want to learn on the most complicated room in the house. Since we weren’t going to be saving money on labor, we had to save on materials. The idea that we might sell this house even five years from now kept me from getting too creative. I don’t tend to think of the type of people who would buy our house as being the eclectic creative types. I think they probably would want highly functioning spaces that are fairly neutral and classic. I’ll have to save my cement tiles, floating vanity and vintage sconces for another house. The artwork is by Emily Jeffords and available on Minted.com. I stuck with the gray, white and black color scheme that I liked. And, I did bring in some brass accents with the mirrors and knobs – two things future buyers could easily swap out. We found RTA (ready-to-assemble) cabinets online, thanks to one of my clients, that shipped quickly for a decent price. They didn’t have very exciting color options, but I like how the almost black color provides a strong contrast to the countertops and floor. I really really wanted those cement tile floors, but they would have been over $1000 plus the labor was more involved, so I went with an inexpensive 12×12 ceramic. I decided that instead of laying the 12×12 floor tile in a square pattern, I would offset each tile and add an accent strip of 1″ marble mosaic next to each one and then repeat the marble in the shower niche. Usually, I like to lay square tile on a 45-degree angle, but our bathroom is so long and narrow, it wasn’t worth it. All of the fixtures are chrome, and I went for a blend of modern on the faucets and a little bit vintage on the towel rings and tissue holder. I chose a white quartz for the countertops that has some gray veining to resemble marble. The shower will be tiled in white subway tile with gray grout. I decided to run the tile vertically to accentuate the height and keep it from looking too traditional. Not pictured, I’m planning on a woven shade for the window, and I purchased white drapery panels with a cute gray fringe by Nate Berkus for Target. I think the window treatments will soften the room and add some interest to that wall. So that’s the plan. Demo is done, and we’re well on our way to a new bathroom. 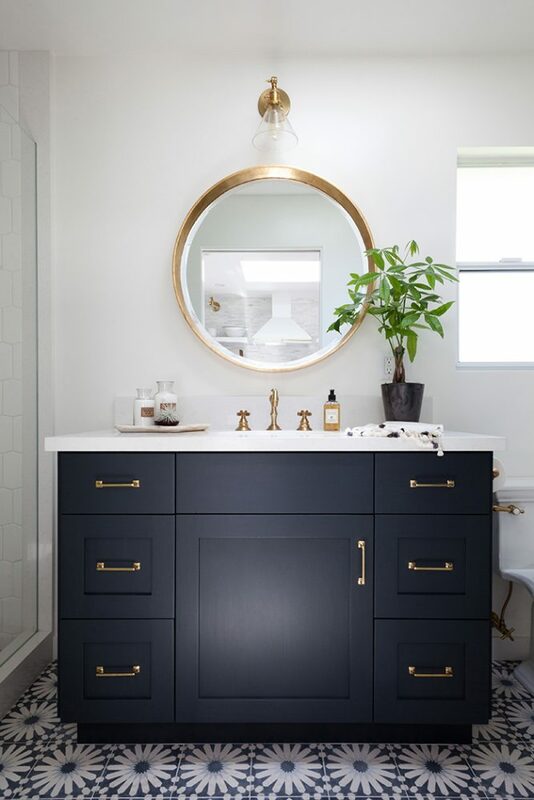 What paint color did you use for the vanity? It’s gorgeous! It’s the Espresso stain color from Kitchen Cabinet King.